The soldier emperors Nikephoros II Phokas (reigned 963â€“969) and John I Tzimiskes (969â€“976) fought against the Rus and also expanded the empire well into Syria, defeating the emirs of north-west Iraq and reconquering Crete and Cyprus. At one point under John, the empire's armies even threatened Jerusalem, far to the south. The emirate of Aleppo and its neighbours became vassals of the empire in the east, where the greatest threat to the empire was the Fatimid Egyptian kingdom. After much campaigning, the last Arab threat to Byzantium was defeated when Basil II rapidly drew 40,000 mounted soldiers to relieve Roman Syria. With a surplus of resources and victories thanks to the Early Bulgar and Syrian campaigns, Basil II planned an expedition against Sicily to re-take it from the Arabs there. After his death in 1025, the expedition set off in the 1040s and was met with initial, but stunted success. Sowing the Dragon's Teeth: Byzantine Warfare in the Tenth Century has translations of the two key military manuals of the era, the Praecepta militaria of Nikephoros Phokas and the revised version included in the Taktika of Nikephoros Ouranos - outlining the tactical system used by Byzantine armies in campaigns against Muslim forces in Cilicia and Syria. Products of experienced soldiers, the texts offer a realistic view of Byzantine warfare and reveal the sophistication of Byzantine military science. Eric Mc Geer places the treatises in military historical context; explores the factors that led the Byzantine army to fight as it did; and investigates morale, discipline, and leadership - all of which determined the difference between failure and success. Nikephorian Byzantine Emperior Basil II's distrust of the native Byzantine guardsmen led him to employ "Varangians" as his personal bodyguard. This new force became known as the Varangian Guard and recruits from Sweden, Denmark, and Norway filled the ranks until the late 11th century - so many Scandinavians left to enlist in the guard that a medieval Swedish law stated that no one could inherit while staying in "Greece" - the then Scandinavian term for the Byzantine empire!! 6mm pictures of this army ! The challenge when picking a Nikephorian list is not to get too carried away with all the (expensive) toys, as you can easily end up with a tiny army that is still quite brittle. The expensive toys in this case are the cataphract wedges and the Varangians. The Post 1042 option to have armoured knights is likely to be the most favoured one, and with them in the army, possibly even as a 6 rather than a 4, you can afford to forgo the 2-base BGs of cataphracts. Lance Bow* cavalry may also be an overindulgence, with cheaper lance-only types a more aggressive option, however the opportunity to shoot enemy foot to disrupted is attractive - and they are often going to be equipped with weapons that mean charging lance armed cavalry is a no-no anyway so you may get time to stand and shoot. In period it is going to be facing mostly mounted shooting armies, so the IC will help to defend against shooting - and for the same reason, the foot units can afford to be poor quality as no-one is going to be charging them on horseback irrespective of their quality. The final waste of points would be to take the Varangians as Elite - take them as heavily armoured by all means as this is a POA up against everyone they will fight however when it comes to quality, superior is good enough, and as someone once wisely said, if your plan needs Elites, you probably have the wrong plan. If you want to use the Nike-style cavalry you can also take a Moorish ally to get a few more skirmishers pretty cheaply which is also a useful option. A valid Byzantine tactic is to open the game by offerer your opponent cash to concede the battle without fighting, with an additional future payment should they agree to add their forces to yours for future engagements against unspecified third parties. Alternatively suggesting they concede in exchange for the hand of your cousins daughter, a generous annual pension and a nice estate in Anatolia can sometimes also pay dividends. You can see some of the figures in the Ancients Photo Gallery also on this site. Many manufacturers produce just one "Byzantine" range, not specifying which era they are for (but most are Maurikian era I suspect). All generic "Byzantine" ranges have been listed here, together with any specifically noted for particular eras. For Latin or other allied troops, use Crusader or other knights of a similar timeframe. 700AD - in the Thematic list - is as good a date as any for round shields to start to change over to kite shields. For Varangians, consider using something from the Viking page. 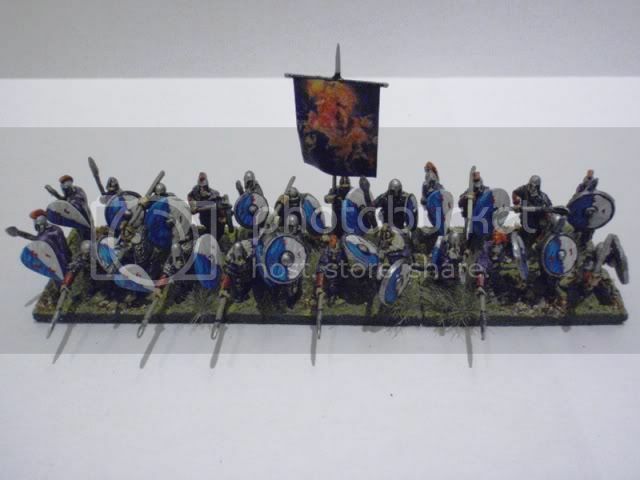 Essex Miniatures - Several Byzantine ranges. 8 Maurikians, 7 Thematics, 10 Nikephorians & 5 Generic Psiloi for all eras in their Ancients ranges. For Nikeforians Essex have two lancers suitable to use, BZA14 Thematic Kataphraktoi and BZA23 Tagmatic Kataphraktoi. In addition, BZA20 Trapezitoi could be used as a lancer if the tunic is painted in such a way as to resemble quilted/padded armor. They also have four useable horse archers: BZA15, BZA16, BZA22, and BZA24. Splintered Light Their Sub Roman British woudl make reasonable Varangians as they have the right mix of hairyness combined with a bit of Roman-style drill and polish. 900 point post 1042 list as used at Godendag 2009 - match report here . This exact list may be illegal as the minimum is 6 drilled Cavalry lancers, and this list only has 4, however it clearly slipped past the list checker (a certain Richard Bodley-Scott). One possible variation of the list would be to replace the Rus mercenaries with a BG of 6 Menalautoi (HF, Protected, Heavy WEapon, drilled). This should free up enough points to upgrade the javelinmen to average.